The past couple of years have seen huge advancements in web application systems across the board, in seemingly every industry. Content Management Systems like HubSpot have significantly broadened their functionality and advanced chatbot AI software like Drift or Flow.ai is everywhere. Even the healthcare space has seen advancements with Columbus-based Olive AI, a software that uses machine learning and AI to automate the more mundane healthcare data tasks. One industry that has always seemed to be behind the innovation curve, a late-adopter so-to-speak, is education (and healthcare, but that seems to be improving). My own student experience and the work we've done in the education vertical have left me wondering, is the LMS completely cut off from any concept of innovation? Is education so ingrained in its legacy systems and red tape that things like positive user experiences and usable data are left behind as victims? This list was super helpful in my search, as it shows exactly which popular LMS's support a Developer API. About This Offering: D2L (Desire2Learn) Brightspace is a cloud-based LMS with solutions for K-12, Higher Ed, and Corporate. For K-12, the LMS can be customized to provide an engaging and age-appropriate experience for students of all grade-levels. Teachers can post announcements, resources, and more on the 'homepage' for each course and engage with parents with intentional access to the digital classroom. A 'Portfolio app' allows students to document and submit their work with pictures and text. The Higher Education solution offers features like analysis of student learning patterns to improve retention, a collaboration and portfolio space for students to interact with professors, and online learning or flexible learning options for those institutions who want to offer online courses. 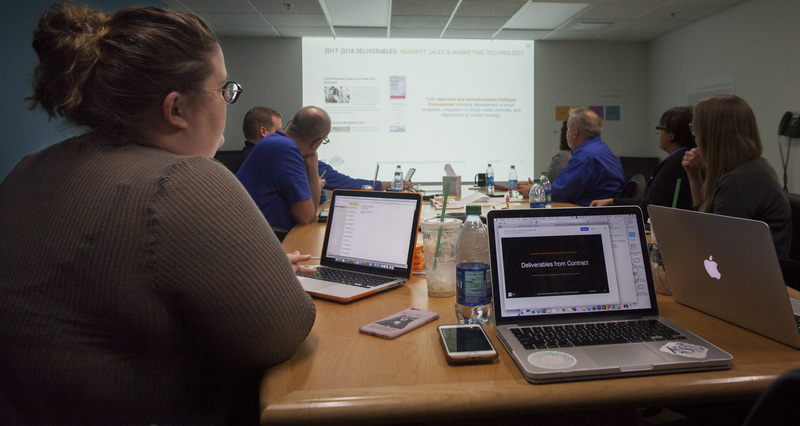 Instructors can also use the software to create video-based course content and track their professional development and continued education. Integrations/Apps: This LMS features an app catalog that showcases all of the integrations that have been built to plug-in to their software. Some of the apps currently offered are a Google Apps integration, an Office 365 integration, and integrations with Turnitin, McGraw Hill Campus, ParSystem by Scantron, and many more. If you don't see the integration you're looking for, your favorite back-end developer has the opportunity to join the Brightspace Partner program to add their home-built integration to the catalog. Pricing: Pricing information was not available, but this LMS offers levels for each solution, ranging from Brightspace Core to Engagement Plus. Before you hit that "Let's Talk" button that is guaranteed to earn you an impromptu phone call, do some digging into the different levels. Determine which level provides the type of functionality you're looking for first, which will help you drive the conversation and control the budget. About This Offering: Canvas is a cloud-based, open source LMS with solutions for K-12 and Higher Ed. Canvas boasts that it is easy and painless to use, mobile-friendly, and customizeable on an instructor-by-instructor level. For K-12, one feature, called the SpeedGrader, allows instructors to annotate and grade from one screen and then sends each grade directly to the gradebook. It allows for instructors to easily create video course content and includes live chat and shared calendars for student-instructor collaboration. For administrators, it provides analytics and reporting on student performance and looks for trends to help instructors use data to drive their coursework. You can find a full list of K-12 Canvas features here. The Higher Education solution includes all of that as well as more customizable options like how the user wants to receive notifications, what the instructor wants the navigation of the course page to include, and automated tasks like follow-ups and due date updates across the entire course. You can find a full list of Higher Ed Canvas features here. Integrations/Apps: Canvas offers many different integrations via an app catalog, similar to D2L. The app catalog they refer visitors to is called Edu App Center and actually includes apps for both Canvas and D2L's Brightspace, as well as a few other platforms. The app catalog includes apps similar to D2L like Google Apps, Office 365, Scantron, and also allows third-party individuals to become partners and add their apps to the catalog. Pricing: Canvas actually offers a free version of their software, Canvas Cloud, so that teachers can try the software in their classrooms and check out the functionality. The free version is obviously limited and not meant for extended use, but a free trial of anything is always good! About This Offering: Workday Student is a combo Student Information & Management System from well-known software provider Workday. It's important to note that a SIS will have slightly different functionality from an LMS. Workday Student provides a platform to communicate with students, educators, and parents and manage student information like addresses. It also accepts attendance applications and manages recruitment campaigns. This software also manages the course catalog, availability, financial aid, and more. This software can be used by both Higher Ed and K-12 schools. Integrations/Apps: The Workday Student software also has access to the list of Workday software partners and the integrations they provide. Some of these integrations include Adobe, Blackboard, and Microsoft. Workday also gives integrators an option to sign up to become partners and have their integration included. Pricing: I could find no hint of pricing on the Workday Student page, so you are on your own. There are several demos that you can watch to get a feel for the functionality before hitting "Contact Sales". About This Offering: Schoology LMS is a combination learning management and assessment management tool specifically designed for K-12 institutions. It includes features like course and lesson planning with optional student-by-student personalization, one-page annotation and grading capabilities, and student performance analysis. It includes a robust collaboration platform for students & instructors that even allows faculty to connect and manage their continued education. It also offers several different ways to visualize student engagement and success with the assessment management aspect of the software. Integrations/Apps: Similar to many of the other systems we've looked at, Schoology has its own App Center with a listing of integrations and apps that have been developed. These apps include the Google App suite, McGraw Hill Education, Unicheck Plagiarism Checker, and turnitin. It also allows developers to sign up to submit their integrations to be added to the App Center. Pricing: Packages come in Basic, which you can try for free and is meant to be used by individuals, or Enterprise, which would be rolled out school-wide and includes their AMP functionality and access to integrations. Request a demo for Enterprise pricing. About This Offering: eThink is an open-source LMS intended to connect to Moodle and/or Totara to provide a truly open source school technology suite. eThink allows organizations to create fully-customized Moodle sites with unlimited modules and storage. The platform is mobile-friendly and features include integrations with other platforms like Google apps, Office 365, and SIS platforms to bring everything together to one place. The platform also supports flipped classroom styles of learning and custom reports that allows administrators to identify engaged and at-risk students. The higher ed solution includes virtual classrooms for institutions that want to offer online courses. The Corporate learning solution offers the ability to customize and brand your LMS so that you can maintain a cohesive experience for your employees and clients. Integrations/Apps: As an open-source platform, eThink supports most of the typical LMS integrations like Google Apps, Microsoft, as well as tools like Proctorio, and also offer the opportunity to become an eThink partner to add your own custom integration. You can find a few of their partners here. Pricing: Pricing information was not available, but something to keep in mind with this software is that it may be best for those organizations who are already paying for Moodle or Totara and are looking for a way to integrate all of your systems together. This LMS is not meant to be used as a standalone. About This Offering: The PowerSchool LMS is an LMS that puts a focus on real-time data and analysis to empower instructors, learners, parents, and administrators. The platform offers several solutions to try to bring all education-related technology to one-system. This includes their Unified Classroom, which consolidates what would typically require many different platforms into one platform, including grading, attendance, instruction and lesson planning, and communication with both parents and students. PowerSchool also offers an SIS solution that handles scheduling, attendance, state-compliance reporting, emergency/medical and health management, registration, and more. This solution also includes a gradebook for teachers called PowerTeacher Pro. There are also solutions for HR, Finance, and more in the PowerSchool ecosystem. Integrations/Apps: PowerSchool has its own Partner Directory that houses all of the integrations that they currently support. Some of the integrations include Microsoft Education, SchoolMessenger, EduTrak Software, Park Bench Software, Leaf Textbook Management, and more. PowerSchool also provides API documentation to build your own custom integration. Pricing: There was no pricing available for PowerSchool and the website is slightly confusing as to what solutions are included or whether each solution carries its own cost, so make sure you look into the different solutions before a demo with them to get a feel for which features you'll need. The concept of switching a new LMS will obviously require a lot more than just picking an innovative new technology. There are things like data migration, training and processes, budget, and so much more to think about. But what you shouldn't do is struggle on with a frustrating, unusable system because the alternative seems too daunting. Ain't nobody got time for that. There are steps you can take to make sure your system implementation process is relatively smooth and pain-free. So what are you waiting for? A good, innovative technology that is implemented correctly can save your organization time, money, frustration, and provide a solid differentiator against your competitors. Happy hunting!